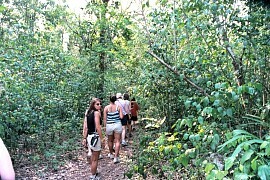 We visit Mayan villages and search in the jungle for spider monkeys. 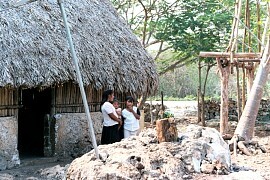 After visiting Coba we traveled to the electricity-less Mayan village named Campamento Hidalgo. We stopped here at this house because the occupants like to show their house off to visitors. 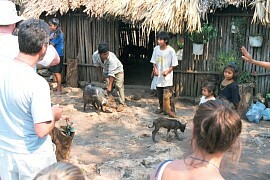 The husband shows off a boar, while a son has a wild raccoon on a leash. There are also a few daughters in the picture. This family has 14 children, and when we visited the mother was about to have another child. It is in Miriam the tour guides best interest to develop relationships with the Mayans in whose area she brings her tourist groups. I don't see anything phoney or dishonest in this. It is apparent that Miriam likes and respects the Mayans very much. All eight or so sisters in this family have the same first name - Maria - with their middle name used to distinguish them. 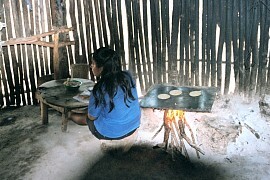 This Maria has the domestic job of making 400 corn tortias per day. Here an older sister looks after her younger siblings. 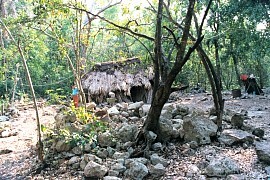 The modern Mayas are farmers and hunters. The fields are located a mile from here. The government gives the men shotguns and ammunition to hunt in the jungle. Miriam says they have no use for money and just grow what they can use or grow just a little extra for something they want, like gold and silver for their teeth. 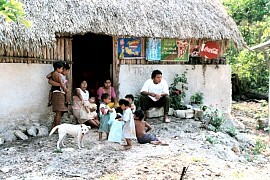 The whole family sleeps in hammocks in this small hut - two to a hammock. We are back in the bus and travelling to the wildlife area where the spider monkeys live. Here are some folks sitting outside a small store along the road. 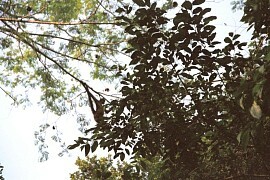 Now we have reached the village of Punta Laguna where a protected wildlife area for spider monkeys is located. This spider monkey was raised by humans because her parents were killed. If she had been released to the wild the truly wild monkeys would kill her. The hope is that tethered outside like she is she will become pregnant, then when she has a baby monkey in tow the wild monkeys will accept her. 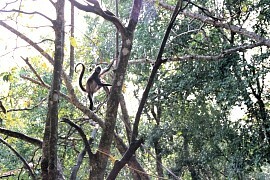 Another shot of the tethered monkey. I marvel at the long skinny arms, legs, and tails. One family lives here next to the entrance to the nature preserve. According to Miriam, the grandparents are well over 100 years old. She said the Mayans often reach extreme old age. We start our short trek into the jungle. Our guide is Juan or "Johnny". 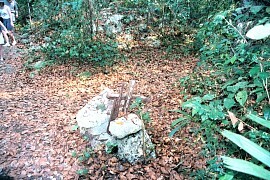 I asked Miriam about this cross in the jungle. I thought maybe it was a grave. She said no, that it was literally an alter here in the jungle for religious purposes. The Mayans apparently mix notions of their ancient gods with todays Christianity. The Rain God is very big around here. There had been an unusual "bloody moon" lately. Miriam asked the older Mayans what it meant. "Either a war will start, or we will have rain". Indeed, we invaded Iraq on Monday of this week. 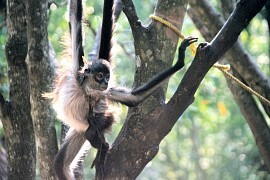 Here we see the first wild spider monkey.